This gonna be good, but fk ps4, PC!!!! Are you 12? You sound like you are. All the big streamers have played it for the PS4 and have already said its …All the big streamers have played it for the PS4 and have already said its horrible, im 12 because i dont like stuttery FPS? calm down console players, i have nothing against consoles, but games like this just cant be played properly on them... this will never be released on the switch due hardware not being up to it, the ps4 pro will barely cope with this. Do they take money straightaway or on dispatch? 12 because i prefer PC? This game will run like dog crap on the PS4, the PC will be totally smooth and most likely have more people playing too, easy to find groups and talk to people over discord, overall much better gaming experience. 12 because i prefer PC? This game will run like dog crap on the PS4, the …12 because i prefer PC? This game will run like dog crap on the PS4, the PC will be totally smooth and most likely have more people playing too, easy to find groups and talk to people over discord, overall much better gaming experience. Have you played it on the PS4? 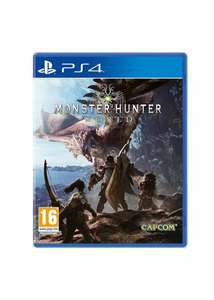 I've played it on PS4 and even in its beta state it was running lovely, also, Monster Hunter is very much a console orientated franchise so it'll likely have a bigger following there (Capcom will be putting much more effort there), especially in Japan where PC gaming is tiny and MH is huge. P.S. I'm a PC owner before you use the dreaded "fanboy" term. I've played it on PS4 and even in its beta state it was running lovely, …I've played it on PS4 and even in its beta state it was running lovely, also, Monster Hunter is very much a console orientated franchise so it'll likely have a bigger following there (Capcom will be putting much more effort there), especially in Japan where PC gaming is tiny and MH is huge.P.S. I'm a PC owner before you use the dreaded "fanboy" term. All the big streamers have played it for the PS4 and have already said its horrible, im 12 because i dont like stuttery FPS? calm down console players, i have nothing against consoles, but games like this just cant be played properly on them... this will never be released on the switch due hardware not being up to it, the ps4 pro will barely cope with this. You're 12 because of the way you go about expressing yourself like a child. No-one with an ounce of self awareness would go "hurr fk da console". I wish I'd spent the price of at least 3 consoles to run games a bit better! I especially wish my console's graphic drivers had to be updated every time I wanted to play a new game. I also wish the console ports were dodgy as hell despite being released months later. But above all, I wish console games were only available digitally so that I couldn't trade/sell them once I'd finished them! Damn. School holidays started early huh? Just stick the attention seeking PC fanboys in the ignore list dude. I kind of enjoy watching him have his meltdown, you know? But I miss the days when the PC scene was mostly mature. Thanks OP, pre-ordered! Best price for this currently. Is payment taken at order or on dispatch please? Don't be coming in here asking sensible questions, we're having a PC v …Don't be coming in here asking sensible questions, we're having a PC v console argument :DIs payment taken at order or on dispatch please? It's taken on order unfortunately. Ok thanks for letting me know. Might have to leave it then. Not sure my wallet can take another hit so soon after BF/CM!!!!! Whoa! This got very PC vs Console lol. I love my PC, I spend far too much money on it but the experience is far superior to that of a console. I don't think anyone can argue 1440p at 165fps isn't the smoothest gameplay experience there is, but boy is it expensive! and probably not suited for the average gamers needs/wants. I don't purely do it for gaming, I love messing/customising with computers and running benchmarks. I like adding new hardware and going back to old games and experiencing them in a new way. I still have all my consoles, mainly for situation like this! No way am I waiting for MH to be released on PC before I play it, I'll put hundreds of hours in on PS4 and buy it on PC later in the year and enjoy both equally. I think the PS4 community will be strong, same as PC's, bit worried about Xbox. Just feel it will sell more on PS4 and on top of that: Japan. Have my consoles for exclusives and anything my work colleagues decide is our next game of the month. Purchasing PC parts is a game in itself for me, all the reviews and benchmarks, takes me a few weeks to make a decision, but I love it.